It is such a pleasure to be able to participate in Therese's Treasures and One Kiss Creations first Blog Hop. Therese and Christine were some of the first followers of my blog so when I saw these wonderful and kind women were coordinating a blog hop I just had to jump on board. I decided to do the peyote challenge aspect of it as I was a bit short on time. I did learn a new stitch however, and it is called the Cellini Spiral. I love the effect it gives and it is basically circular peyote done in varying size beads to give it a lovely effect. My first piece was a commissioned piece that is already at its new home. I call it Shelley's Vision as it is named after the beautiful lady that commissioned it. I used Size 8/0, 11/0, and 15/0 seed beads in teal for this one. 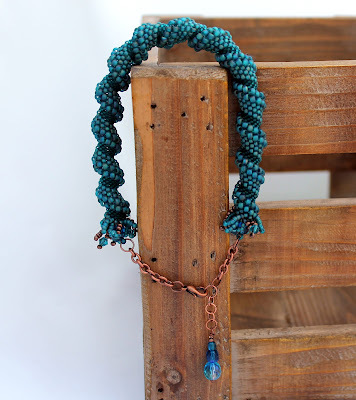 I ended it in a short fringe and attached copper chain to finish the piece. Thank you so much Ladies for hosting this. It has been a blast! I would love to do anymore Hops that you come up with in the future. I love these! They turned out perfectly, mine are always so stiff I can hardly bend them! This is Shelley..and yes the bracelet is gorgeous AND its all mine...get your own! Lol thanks Marla. Oh wow! If that is what you create when you're short on time what masterpiece do you have up your sleeve?! Both are gorgeous! Marla - these are both gorgeous!!!! I love cellini spiral - but I rarely have the patience to begin it! And I forgot just how much I loved orange, until I audibly gasped when I scrolled town to that "Orange You Glad" piece - I am glad indeed! Great detail with the peace symbol too! Marla, I am so impressed with your skills. You just learned cellini, and made two of them! I also love this stitch, but I have several in my unfinished drawer, because they are such a time sinker! I absolutely love how you finished them, that is such a great idea!! 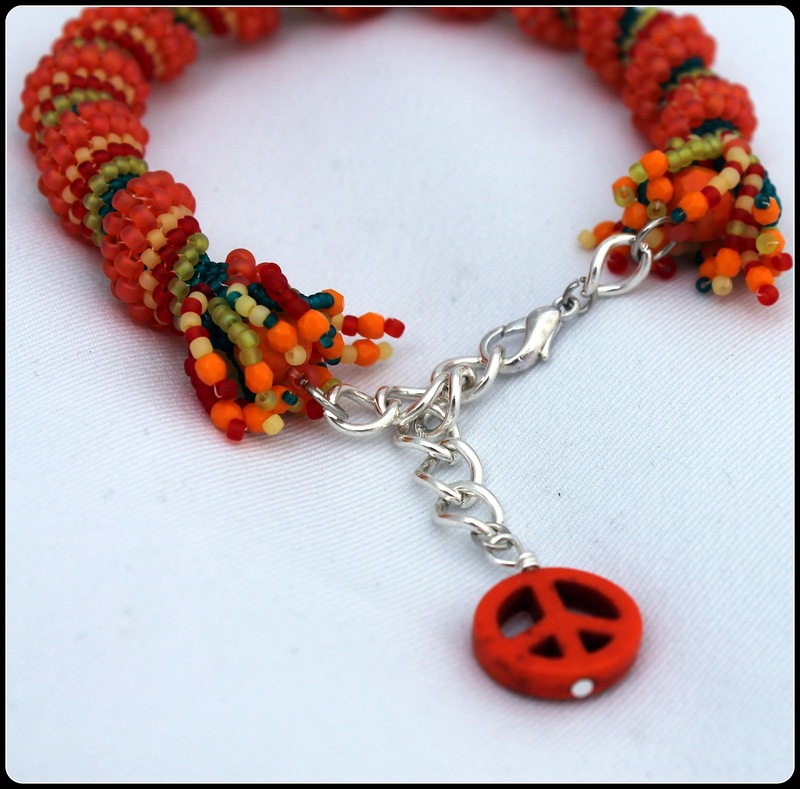 I love both of your Cellini spiral anklet/bracelets the colors are great. I really like the second one with the bright orange, green, and teal colors. Great job! Oh Cellini, what beautiful execution of the concept. I really like what you did with these. Great job! Nice colors. Nice design. Ooooooo! I am SO glad the orange one I saw on Facebook made it to the Hop. I was hoping it would! These are so Beautiful in their spirals and touch of fringe and their colors...the teal is so soothing and the orange is so vibrant! Both perfect in their different feels. Yes, yes I AM glad because orange is my favorite color!!! =) Both pieces: stunning! I have always admired this spiral but never had nerve to try it. You did a great job and the tassel adds such an interesting feature. Love the teal color - beautiful! The Cellini pattern caught my eye right away. Someday I hope to tackle it. 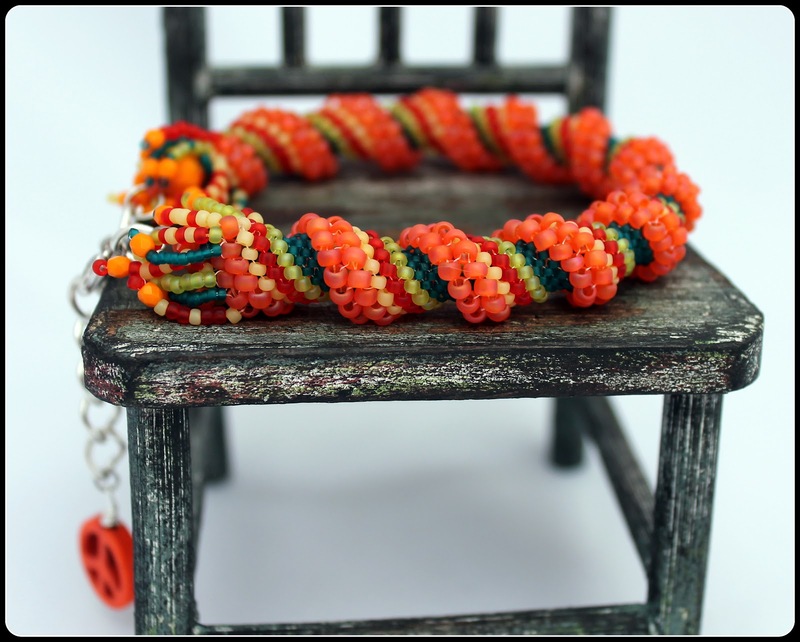 The turquoise is so beautitul and the Orange You Glad looks like a fun to wear summer color splash! Beautiful work! They're both beautiful, fun, and perfect for summer. I especially love those oranges with the teal and citrus green. Marla! WOW!! WOW!! WOW!! your spirals are so perfect and the colors, especially the dramatic contrast in the second bracelet is just exquisite!! GORGEOUS!!! Great pieces! I love the colorways you used in both. And you are right about the stitch being a time sink -- I spent many hours catching up on what was on the DVR finishing my for this hop. Love your work! Operation Tacle that Bead Stash - how fun!